Rufous-fronted Parakeet, a threatened psittacine endemic to Colombia, has been recorded nesting inside a building for the first time, possibly offering a new conservation opportunity for this rare and range-restricted species. 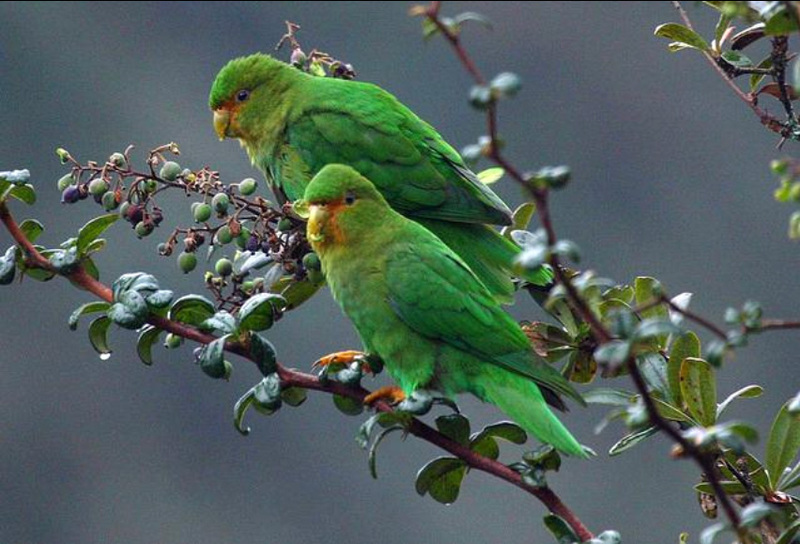 An almost all-green, dainty parakeet just 18-19 cm in length, Rufous-fronted Parakeet inhabits the temperate tree-line and open paramo (grass-shrub zone) mainly between 3,000-4,000 m altitude in Colombia's Central Andes. The species is listed in the IUCN Red List of Threatened Species as 'Vulnerable' to extinction, and is included in a project of the Colombian NGO, Fundación ProAves, for the protection and recovery of threatened parrots of the Cordillera Central (Central Andes), which has been supported by Loro Parque Fundación since 2003. Rufous-fronted Parakeet is endemic to Colombia's Central Andes and is listed as Vulnerable (Ian Adam). The species' favoured habitat is contracting due to agricultural activities, especially cattle grazing and related burning. Farmers replace the native plants with grass, which is bad news for the paramo as cattle slowly erode the land, making it unfertile and poorer at retaining water. It may be that Rufous-fronted Parakeets can tolerate some habitat alteration, as they are sometimes observed feeding in fallow fields and areas altered by grazing. They are social birds which are usually observed in flocks, sometimes consisting of as many as 100 individuals. They feed on or near the ground, mostly taking grass seeds, as well as some small fruits and flowers of shrubs and bushes. In February 2007, a field team at ProAves made the singular discovery of the first-ever nest of this species. It was constructed of moss and placed 18 m high in the canopy of a guayabo tree (Myrcianthes sp) growing in an open area of sub-paramo, at 3,000 m above sea level (asl). Observations by the ProAves biologists revealed that six parakeets visited the nest daily, which strongly suggests that the species can be a co-operative breeder. Remarkably, until the recent discovery of the nest in a building, the tree nest had remained the only documented nest of the species. Rufous-fronted Parakeet is known to roost communally on cliffs and rock-faces, and there are unsubstantiated reports that it also nests in such places. In February 2008, Colombian biologist David Bejarano Bonilla reported a suspected nesting colony of about 200 Rufous-fronted Parakeets in a rock face, some 1,200 m long and 100 m high, located in the buffer zone of Los Nevados National Park at 3,550 m elevation. He scaled the rock face, but did not find evidence of breeding. The large roosting cliff on the edge of Los Nevados NP, Colombia (ProAves). Ten years later, Bejarano, in the same buffer zone of the national park, discovered the nest in the building, a rural primary school situated at 3,400 m asl. The nest was inserted into the ceiling cavity between wooden boards below and zinc sheeting above, and was built with straw and small, thin twigs, stacked as a platform without a particular shape. In mid-July it contained two nestlings being cared for by two parents. This report of nesting in a human construction permits speculation that this species might use other man-made structures for nesting sites, and possibly artificial nests as well. Given the sparse distribution of natural rock-faces in the region, it could be that a conservation strategy can include small constructions to entice Rufous-fronted Parakeets to breed more evenly across the landscape. What a boon it would be for environmental education if more parakeets can be tempted to nest in more rural schools! Bejarano Bonilla, D A. 2018. First nesting record of the Rufous-fronted Parakeet (Bolborhynchus ferrugineifrons) inside a building. Bulletin of the Sociedad Antioqueña de Ornitología 27: 7-10.